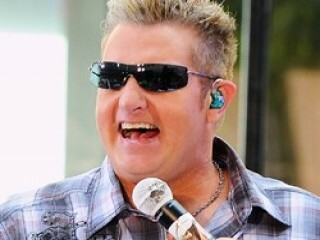 Gary LeVox is the lead vocalist of American country trio Rascal Flatts. His stage name (LeVox) literally means "The Voice", a name he lifted from the studio-console label for his lead-vocal track. Gary Wayne Vernon Jr. was born in Columbus, Ohio. Before he became famous, he worked at Ohio Department of Mental Retardation and Developmental Disabilities in downtown Columbus. Gary's first musical performance was at the age of eight, in a play at his church. Gary graduated from Olentangy High School and is an alumnus of Ohio State University. Prompted by his cousin, LeVox moved to Nashville, Tennessee in 1997. LeVox and his second cousin, Jay DeMarcus, started out together in Chely Wright's band. One day, when the regular guitarist wasn't available, Joe Don Rooney stepped in. The three men say they felt the chemistry immediately. Has two beautiful daughters: Brittany Kay Vernon (born on 26 August 2000), Brooklyn Leigh Vernon (born on 21 March 2004). Was once roommates with Oscar winner Jamie Foxx. View the full website biography of Gary LeVox.